As with other recent considerations of the nature of social relations in middle-range societies, these chapters focus on exploring some of the relationships between Neolithic social relations, material culture, and symbolism and meaning. One of the relatively recent developments in the study of Neolithic social systems is that researchers have begun to employ a wider range of material data sets to explore the nature of social relationships within and between different social units. In this section, three researchers explore the function, role, and possible social messages developed by the construction, use, and destruction of anthropomorphic and zoomorphic clay figurines, as well as ceramics, of the Pottery Neolithic. Moving between consideration of data from individual settlements to discussion of the broader existence of shared material systems in Near Eastern Neolithic communities, these authors explore the social context of a wide range of material objects, their possible meanings, and how archaeological data help us to understand how groups and individuals may have employed figurines and ceramics to negotiate relationships, differentiate select members of the community, and/or link individualsacross the household, community, and intercommunitylevel. Based on his long-term interest in ideology, ritual, and social change, Jacques Cauvin attempts to intellectually bridge between broader regional changes in figurine use in the Neolithic and past belief systems. Cauvin provides a detailed consideration of the cognitive and symbolic nature of Neolithic cultures in the Near East, arguing that the Neolithic revolution represents, above all else, a profound mental and social transformation. Adopting a comparative perspective for the entire Near East emphasizing the symbolic uses of material culture as a means of constructing social meaning, he argues that the emergence of food production is not a reaction to a necessity for food but is a by-product of a new way of looking at the environment by humans, and that this is expressed through the symbolic and physical use of figurines and skulls. In brief, he argues that the transition from the Natufian to Neolithic was one in which the nature of symbolic systems was transformed from the Natufian emphasis on animals to that of the Neolithic emphasis upon women and bulls. Based on a consideration of the environmental context within which the revolution of symbols occurred, Cauvin rejects the argument that changes in social organization were linked to overexploitation of the environment; he suggests that ideological changes were indigenous and reflect new ways of conceptualizing the relationship between the environment and human culture. Noting that "religion," as is the case in traditional societies, is both cognitive and dynamic and explains the cosmos as well as simultaneously managing social tensions, he argues that the widespread appearance of clay and stone figurines in the PPNA reflects a ritual and religious focus on collective ancestors and divinities as part of organized ritual life. Cauvin places the Neolithic transition of symbols within the scope of the emergence of institutionalized inequality and changes in social relations within communities and in how humans conceptualized their relationship with the physical environment. Mary Voigt synthesizes published archaeological data on figurines from the Neolithic settlements of Hajji Firuz Tepe, Gritille Huyuk, Nevali Cori, and CatalHoyuk and explores how these data inform us as to how and why ritual practices were employed during the Neolithic in the northern areas of the Near East. Expanding Ucko's(1968) functional framework for figurines, the author illustrates how figurines from Hajji Firuz Tepe and Gritille and the analysis of breakage and wear patterns on the figurines demonstrate patterning consistent with ethnographic uses of figurines as "vehicles of magic" and symbols of worship in which figurines were used in rituals intended to convey social and spiritual meanings. She argues that Neolithic clay figurines were often intentionally incorporated into roasting or ash pits as part of household ritual practices. Based on contextual information, she notes that animal figurines (specifically cattle) were often recovered from domestic areas and were, therefore, most likely symbolicallyassociated with herd fertility and production rather than hunting. In contrast, the frequent occurrence of human figurines with protruding stomachs, navels, and breasts (presumably female) appear to be associated with the well-being of females and children. Moving to a detailed discussion of changing use of figurines during the Neolithic occupation of Catal Hoyuk, the author argues that stone and large clay figurines were employed as cult statues. She interprets their changing use from the position of form, archaeological context, and the condition of the artifacts at the time of deposition, and develops generalizations based on ethnographic parallels. Voigt argues that rituals were employed as a means of alleviating social stresses, ensuring the well-being of the community. In her conclusion, the author briefly addresses the implications for such a strong regional patterning, how these collective data inform us cf social relationships within and between settlements, and how specific ritual practices were employed to craft social relationships. Finally, Estelle Orrelle and Avi Gopher address several aspects of the meaning, symbolism, and decoration of pottery from several periods of the Pottery Neolithic. Placing this discussion in the context of the entrenchment and expansion of food production, the authors explore how the social manipulation of symbolic material culture may inform researchers as to the nature and mechanisms of social and economic change in Pottery Neolithic communities as materially expressed through figurines and decorated and undecorated pottery vessels. Moving beyond functional considerations,they regard the first pottery assemblages as fulfilling a social role, focus on describing the main elements of these symbolic assemblages, and highlight some of the possible implications of these artifacts. In the context of the earliest stages of the Pottery Neolithic period, they argue that specific motifs stood as symbols for a social system governing rules of access to women. Dealing with material systems in the later Pottery Neolithic, the authors argue that vessels of clay traditionally identified with the female body and social body acted as a kind of blueprint onto which the norms and beliefs of societywere displayed and which were expressions of restrictions and guidelines for social behavior in the Pottery Neolithic. 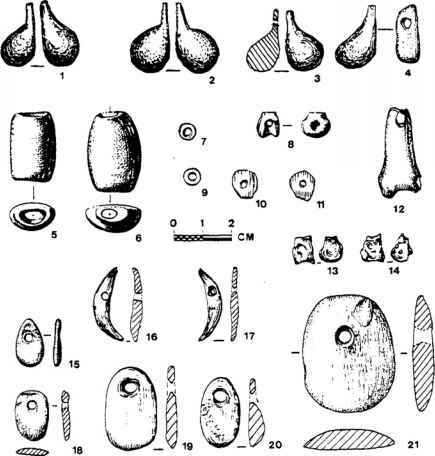 This chapter, as with the previous two, provides a provocative and thought-provoking exploration of the possible interconnections between some aspects of Neolithic material culture, symbolism, meaning, and the way social relations were structured at the household, community, and regional scale.